...a glimpse of what life is like living on a farm. Taken about 15 years ago, this photo was originally in print. I'd like to thank IT Guy for scanning it for me and MAXX for doing a great job improving it's quality. This is one of the first photo I took when I was learning photography to use the camera. I was just using a point and shoot camera then. This was a requirement for my Photojournalism class. This is a typical day at the farm. I took this photo in one of my vacation...or did I just go there to take photos for my class...not sure now. 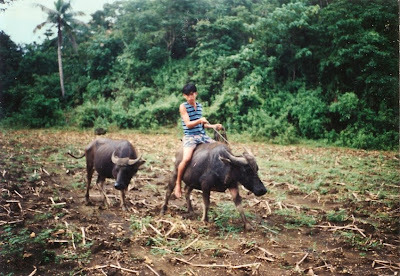 Anyway, this is a water buffalo, and we call it carabao or kalabaw. They help us plow the farm as not all can afford the tractor that most of the farmers in other countries have. The farm of my grandparents as I've mentioned before were mostly on rice fields, so they have plenty of carabaos to help the people farm the land. Happy (not so) WORDful (less) Wednesday! Farming there isn't like in the US. It's good to see how others around the world live. What a great picture! I love learning about the world through blogs. What a great picture!! My grandparents just went to the PI last summer!! I would love to visit one day! It's a great picture, and even better for knowing the story around it. What an interesting shot. Farming is so different around the world. How neat. I enjoyed your story. That's a wonderful shot. Farming is not easy! My wordful is posted....mine is of the feathered kind. Johnathon Livingston's kin. Stop by if you can. In Egypt, people farm using the water buffalo (they call it a gamoosa), too. Nice picture! Happy WW to you! I hope that you will come and see my entry, too. I had no idea your grandparents had a farm. D's grandparents did, too, but it was a dairy farm, I believe, other than growing vegetables for family usage. It's a very different look. I'll see if we can scan that picture. Excellent first time photo! Great that you were able to scan and improve the color quality. that is a great photo! it would be nice for you to go back and take more and post side-by-side to show your progress in photography! Very interesting photo! So different than where I live (as you could probably see from my desert photos). I love these little WW glimpses of life all over the world! Thanks for stopping by my WW post! This is the coolest picture--it totally gives me a glimpse of what farming is like there! I didn't know you could ride water buffaloes (sp?)!! I guess we're spoiled over here in the US. But I know how it is. I couldn't afford fancy equipment when I redid the back and front yards, so I had to everything via hard labor. I like this shot, and like seeing pictures of the Philippines. I thought water buffalo were a lot bigger. Are those young ones? Nice shot; it's cool to get a glimpse into a different way of life.